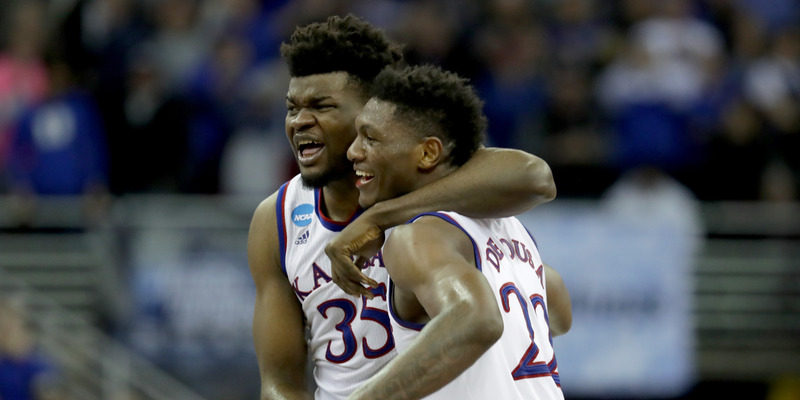 Streeter Lecka/Getty ImagesWhile the Kansas Jayhawks headline the AP Top 25 preseason poll with 37 first-place votes, seven different programs earned votes for the top spot for the first time since the 2004-05 season. For the third time in program history, the Kansas Jayhawks headline the AP Top 25 preseason poll with 37 first-place votes. No. 1 Kansas, No. 2 Kentucky, No. 3 Gonzaga, and No. 4 Duke appeared in the top four spots – in various combinations – across nearly half of the ballots. Although the Jayhawks lost three of last season’s starters, they have added three notable transfers and the fifth-ranked recruiting class to pair with their returning starters from last year’s Final Four squad. In most recent years, the conversation at the start of the college basketball season surrounds one mega team that is destined to dominate the rest of the field. For the first time since the 2004-05 season, seven different teams received first-place votes in the AP Top 25 preseason poll. While the Kansas Jayhawks came out on top with 37 votes for the top spot, No. 2 Kentucky, No. 3 Gonzaga, No. 4 Duke, No. 5 Virginia, No. 6 Tennessee, and No. 9 Villanova all received at least one first-place vote. That being said, voters seemed to reach a consensus with the top four teams. Kansas, Kentucky, Gonzaga, and Duke appeared in the top four spots – in various combinations – across nearly half of the ballots. Although the Jayhawks lost three of last season’s starters – including AP All-American Devonte’ Graham – they have added three notable transfers and the No. 5 recruiting class to pair with upperclassmen starters Udoka Azubuike and Lagerald Vick from last year’s Final Four squad. Although they haven’t sat atop the preseason poll since the 2014-15 season, the No. 2 Wildcats have found themselves in the preseason top 5 for the last eight years, while the No. 4 Blue Devils – who topped the rankings in each of the past two years – have been a top-10 team in the each of the last 23 preseason polls. Third-ranked Gonzaga, meanwhile, earned its highest ranking in a preseason AP poll in program history.